The final US session of the week has gotten off on the wrong foot with a wave of selling hitting stocks from the opening bell with the Dow (US30 on xStation) sliding more than 250 points. Jitters over the global economy following the disastrous manufacturing data from the Eurozone this morning are understandable, and after a couple of topsy-turvy days how the markets trade into the weekend could be telling. 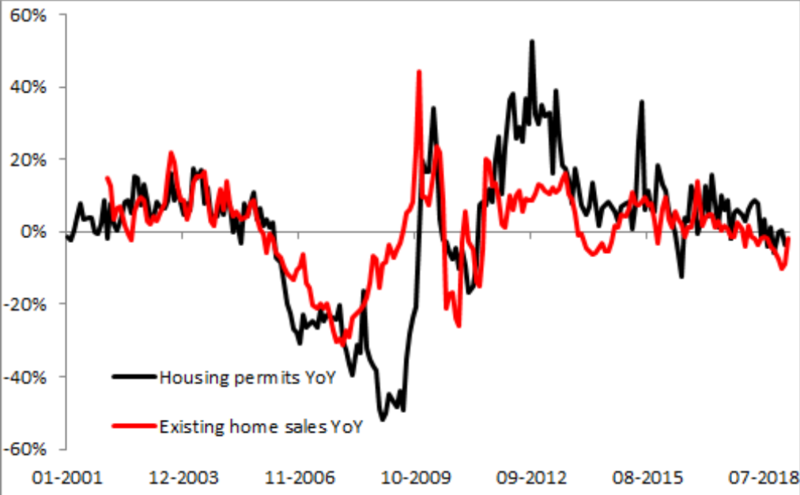 There’s little of real note on the economic data front out, although the latest housing figures are plasing, with a print of 5.51M for the February existing home sales. This is well up on the 5.1M expected and represents quite a jump from the 4.94M seen last time out. The shape of the yield curve is often viewed by economists as a gauge of future expectations for the economy, and the fact that the US curve just inverted could be seen as a major warning sign. To be specific the yield on a 3-month Treasury bill has risen to 2.467% this afternoon, while the 10year note yield has fallen nearly 10 basis points to 2.444%, which means the 3-month/10-year yield spread has turned negative or inverted. 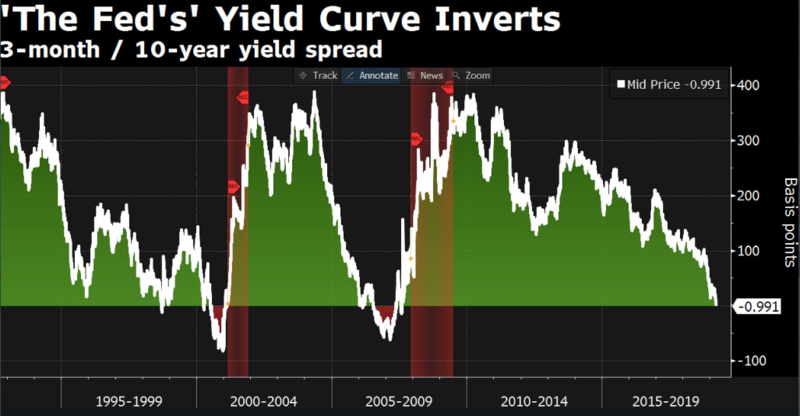 This is the first time the yield curve at these points has inverted since 2007 and is seen by some as a key predictor of economic downturns and recessions. The logic behind an inversion being bad news is pretty sound as it suggests that investors believe rates will fall in the future as the central bank responds to a slowing economy. This often occurs at the top of a hiking cycle as near-term rates reflect a relatively high Fed funds rate, while longer term rates more reflect expectations for future economic growth. One of the bigger fallers this afternoon is Nike, with shares in the sportswear giant tumbling almost 5% after it reported disappointing sales growth in North America. On the face of it the results were decent, with earnings per share (EPS) beating the street and revenue coming in inline. "Our business momentum is being accelerated by our ability to scale innovation at a faster pace and expand new digital consumer experiences around the world," CEO Mark Parker said. The company also called out "continued momentum in China," a geography it's said it's still "bullish" about despite uncertainty about tariffs. "We have great momentum in China, but we are still far from realizing the long-term opportunity in this market," CFO Andy Campion told analysts.